Conversely speaking, that which comes from within is what makes a person holy! Often, we are more concerned about that which is on the outside than that which is on the inside. We often worry excessively about how we are perceived by others, how we look, or what our reputation is in the eyes of the world. This Gospel specifically addresses the charge of the Pharisees that eating certain foods defiles someone. Jesus isn’t buying that. He is pointing our attention to our hearts. What is there in our hearts? And what is it that comes forth from the heart? This is what makes us who we are. Though this deals with the worries that certain foods will defile, it also deals with much more. It addresses the tendency of purely external observances of God’s law. Thus, it addresses the tendency of the Pharisees to be excessively worried about how they are perceived by others. Their external observance of the law reveals the fact that they seem to be overly concerned about what others think about them and what others say about them. They want to look holy. They want to look like they are beyond the smallest of indiscretions. But it’s all an appearance and not reality. For that reason, Jesus puts the attention on the internal. God sees what is in our hearts. Even if no one else sees this we should never forget the fact that God sees all. That’s all that matters. That which is in our hearts can either do great damage to us or do great good. There are those who, in the public perception, are way off base. But from God’s perspective they are right on target. Conversely, there are those in public opinion who are shining stars, but from God’s perspective are way off base. There is only one thing that matters: What does God think? Reflect, today, upon that which is inside your heart. This introspection should also challenge you to look at your motivations. Why do you do what you do and why do you make the decisions you make? Are they choices that come from an honest and sincere heart? Or are they choices that are based more on how you will be perceived? Hopefully your motives are pure. And hopefully those pure motives come from a heart that is deeply united to the heart of Christ. Lord, please make my motives pure. Help me to live only out of a pure heart. Help me to always realize that holiness is found only in serving You and not in serving my public image. 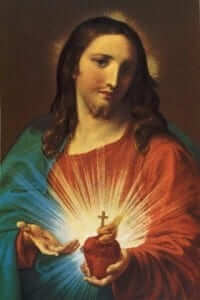 I love You my Lord. Jesus, I trust in You!